We are getting close to NamesCon, the domain industry conference that is expecting to bring over 1,400 attendees from all over the world! NamesCon 2017 will be held at the Tropicana Las Vegas Casino Hotel Resort from January 22-25, 2017. There is still time to register to attend this year’s conference! To help introduce people to our sponsors, we are running this Sponsor Spotlight interview series. Today’s Spotlight interview is with Andrew Hazen, founder of the Bagel of the Month Club. Bagel of the Month Club ships authentic New York Bagels made by 6th Generation bagel bakers. We offer customers “real” New York bagels with Free Shipping across the U.S. and we ship FRESH (not frozen) bagels the same morning the bagels are baked. Many of our customers are ex-New Yorkers who cannot find a “real” bagel outside of New York. We also send FRESH New York bagels to many students and parents/grandparents. We also have many corporate clients that send New York Bagel breakfasts to clients, their teams, etc. as a way to say “Thank You”, “Happy Holidays” or ‘Well Done”. One of our biggest competitive advantages is that we do not manufacture the bagels ourselves. We have partnered with Bagel Boss, which has 13 locations and is operated by 6th Generation bagel bakers who have 40+ years in bagel-baking experience. Leveraging my expertise with digital marketing as allowedBagelOfTheMonthClub.com to grow and scale quickly. In fact, the business is up nearly 200% from 2015 to 2016. As an entrepreneur growing up on Long Island, NY I was ALWAYS working. In 10th grade I started working as a bagel baker at Bagel Boss. I became very friendly with the owner and worked at Bagel Boss from High School through college and even during Law School. Years later, when I was attending law school in Michigan, my parents would ship me Bagel Boss bagels from New York to Michigan and they were DELICIOUS (I was constantly toasting them in my apartment and attracting new friends in my building). It was during law school in 1997/1998 that I started investing in domain names and it hit me – “There were Fruit of the Month Clubs, Beer of the Month Clubs and even Chocolate of the Month Clubs but no Bagel of the Month Clubs and with that in mind, I told my friend Adam who owns Bagel Boss that I was launching a Bagel of the Month Club and he said “Bring me the orders…” and that was it! What major milestones has your company accomplished? In a short time we have received lots of media attention and we have been featured on Yahoo News!, Good Day Sacramento (watch here –https://youtu.be/MHhYIedZ9Tk), Parade Magazine, WCBS and Newsday. In 2016 we produced the first Annual National Bagel Eating Contest and it was a huge success – watch recap herehttps://youtu.be/vwnAQeji7dQ. I am looking forward to meeting fellow domainers at NamesCon and talking about how to build businesses around domain names. What are your thoughts on the new TLDs? I am not a big fan of the new TLDs and the only ones I’ve really bought is Lofts.nyc and Bagel.delivery. What are you most looking forward to at the upcoming conference? I am looking forward to meeting and networking with like-minded entrepreneurs and domainers as well as learning from the speakers. After 2-4 days of transit, you have to wait another few days to finish them, what are these bagels like on day 5? 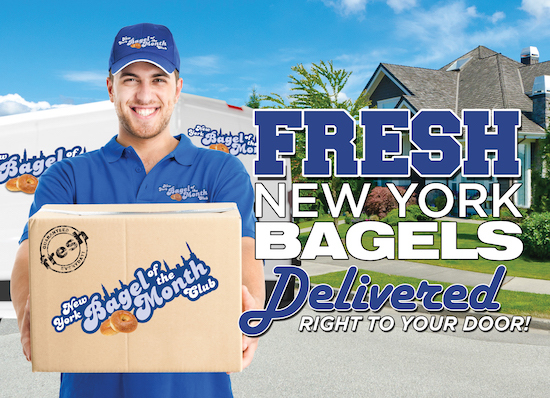 We ship orders that are bagels only via USPS Priority which gets our FRESH New York bagels delivered within 2-3 days. We also include storage instructions and freezer bags so any left-over bagels can be put in the freezer. NOTE – a ‘real’ toasted New York bagel still beats non-New York bagels (GRIN). Bagels with lox & cream cheese are shipped Next Day via FedEx. We also have our own proprietary way of packaging the bagels to keep them fresh. We ship tens and tens of thousands of bagels across the U.S. with very little problems. Love Bagel Boss- Great NY Bagels! Looking forward to seeing Andrew and Richard at Namescon in a few weeks! Happy New Year! Looks like my bagel delivery startup BAGEL.CITY has some pretty fierce competition. BAGEL.CITY’s bagels taste better! When it comes to freshness, the words “bagel” and “month” don’t go together. Andrew is an inspiring guy! When I met with him, I found his entrepreneurial spirit infectious. I look forward to seeing you at Namescon, Andrew. It has been a long time since I saw you. Thank you Jeffrey – very kind of you! Looking forward to catching-up at NamesCon…Happy & Healthy New Year!